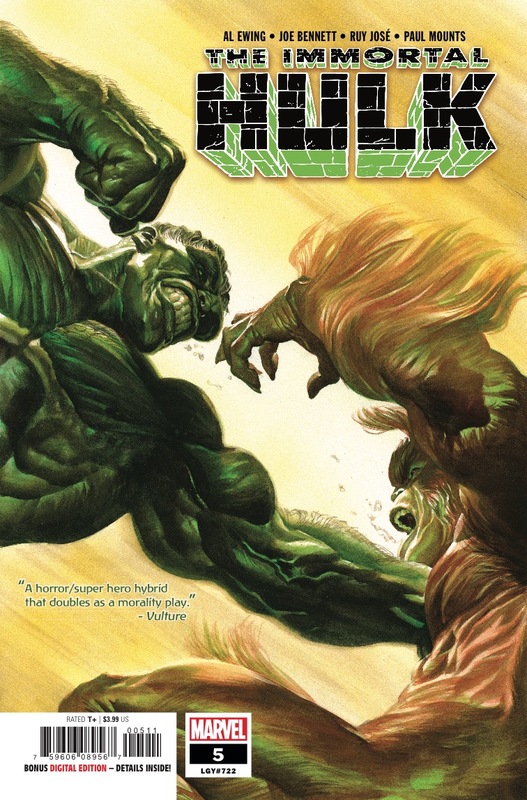 The Immortal Hulk #5 Review – AiPT! A must read Hulk comic for longtime fans. This changes everything! The beauty of Hulk is how simple the character is on the surface, but deep down that rage and anger are some of the most complex emotions to write about. Al Ewing is exploring that and more in this new “fresh start” from Marvel Comics, and in this fifth issue he brings the house down — literally and figuratively. Hulk has been resurrected, so all the things that happen here are fair game to develop the character from scratch. The series has used the character of a horror movie monster proxy very well too, with incredible art from Joe Bennett. I’m not sure I’ll ever look at Hulk’s face again and not think of the angular and huge face Bennett has rendered in this series. This is also a great monster vs. monster issue pitting Hulk vs. Sasquatch. I was never too familiar with Sasquatch, but Ewing and Bennett have made me want to dig in and learn all about him after this and the last issue. He’s a killing machine after waking up the last issue and poor Walter is trapped inside. This issue was set up very well to have Bruce/Hulk attempt to connect to the character and he does in a very surprising way. I won’t spoil it, but it possibly changes everything going forward. Somebody inform Stan Lee, because Ewing is doing some exciting stuff with this character. The action, and there’s a lot of it, is sustained due to this big reveal. As Hulk attempts to understand what is going on with Sasquatch by beating his face in, the truth is possibly worse than getting his eyes gouged out (which actually happens). I’m usually bored to tears when it comes to monster fights but here there’s a purpose to every blow. Joe Bennett once again delivers on the extreme close-ups of Hulk’s face. He is haunting, yet on some level beautiful too. In concept, Hulk is somehow simple since he’s just muscles and some purple pants, but Bennett adds a monstrous nature to the depth of his eyes in his head, the bulbous neck muscles, and the jutting bones in his face. The action is great too, making you believe Sasquatch is really hurting Hulk. You’ll believe two giant monsters could go at it in a hospital in part because of the visuals. Is it crazy the big twist in this issue makes me nervous? There’s a reveal that potentially changes this character at his core and I’m holding out hope Ewing and Bennett can pull this off. So far they’ve proven they can and then some. The Immortal Hulk brings the house down literally and figuratively with excellent monster action and perfectly written character writing. I’ve liked my fair share of Hulk stories in the past, but this might be an instant favorite. An excellent issue that ties emotion with action and has one hell of a reveal. The big reveal is so big I'm scared they won't pull it off!